Contractors working on behalf of the Environment Agency have discovered a major structural issue with a large section of lock wall behind the left-hand tail lock gate. This entire section of the lock now requires a complete demolition and full rebuild. This unforeseen work will take a further 12 weeks to complete. It is therefore anticipated that the lock will remain closed until the end of June 2017. For more detailed information from MRUA see Reply. This entry was posted in Motor cruising, Navigation by admiral. Bookmark the permalink. This lock was built over 100 years ago and has over that time given many years of good service, we are all aware that it was beginning to show signs of age and was beginning to fail, it was leaking fairly badly and the operation was becoming more and more difficult. The EA managed to secure £3 million of funding from central government to fully refit the lock completely. In order to secure funding various investigations and examinations were taken in an attempt to establish exactly what and where and how the work should be conducted. It was agreed with the MRUA that the navigation would be closed for the winter period of 2016/17 thus trying to limit any potential effect on the boating community, both business and pleasure. Before the main work commenced, over £280,000 was spent on this investigation work which included, structural surveys, concrete coring, boreholes and diver surveys. This work was undertaken to reduce the likelihood of finding problems during the main construction work. Once the main work began it became evident that the condition of the concrete structure of the lock was far less stable than first thought and divers spent weeks placing heavy weights in the bottom of the lock and props across it to prevent it collapsing before the lock was drained. This set the project back some weeks but the weather had been kind and there had been no floods to prevent the work continuing at a good pace , work was on schedule to be completed by April. That was until this week when it was discovered that despite all investigation work there was a major fault with part of the existing lock wall. this section of wall is behind the left hand (as you look downstream) tail lock gate, where there is a formed recess to give full access to craft, this wall is 5 metres high and should be get gradually thicker from the top to the bottom. Sadly the construction workers discovered that at its lowest point was found to be only a few inches thick, when it needs to be in excess of 2 metres thick. 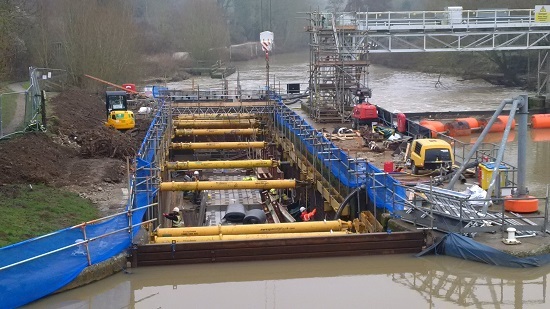 This was completely unexpected (neither Eldridges, Hampstead or Teston Lock had this problem when they were rebuilt) and quickly extra propping had to be installed to prevent its collapse. The Environment Agency told us that they believed that spending £280,000 on investigations before the work commenced should have been enough (also based on experiences with the other locks) and this weakness that has been discovered could not have been foreseen. The Environment Agency did go on to say that they could have spent an extra £500,000 on draining the lock the previous year to undertake more investigations but this was thought to not be a good use of very limited public/ tax payers money. And time. However there is very much a call for some form of compensation, due to the lack of use of part of the River. The fault however is not the fault of the EA, they have contracted other companies to conduct the work on their behalf, as such we feel that no-one is directly to blame. These and other issues need to be looked into, and investigated, before any conclusion can be formed. We are happy to receive any questions and will endeavor to answer these fully.